This ranks highly on the nerd-alert scale, but anyway, here we are. 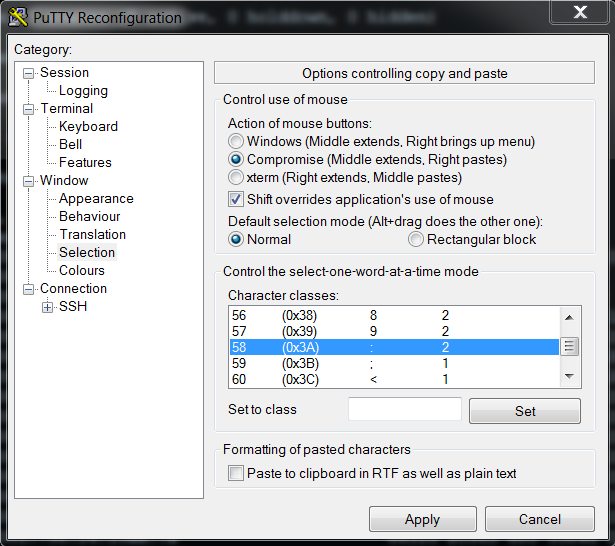 Putty has a nice feature where you can select a word with a double click. It’s really handy, especially when you are dealing with IPv4 prefixes. It doesn’t work with IPv6 addresses by default. 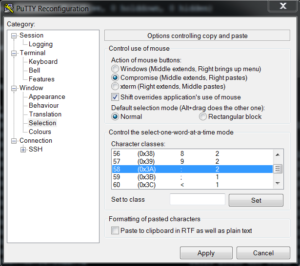 You can edit what Putty uses as a delimiter, under Settings -> Selection. Scroll down to ‘:’ (or whatever character you want to change the behaviour of!) and change its class from 1 to 2. If you save this as your default settings, from now on you can get a nice double click selection of IPv6 addresses.